Browse Missing Link Gallery: Recent | Popular. 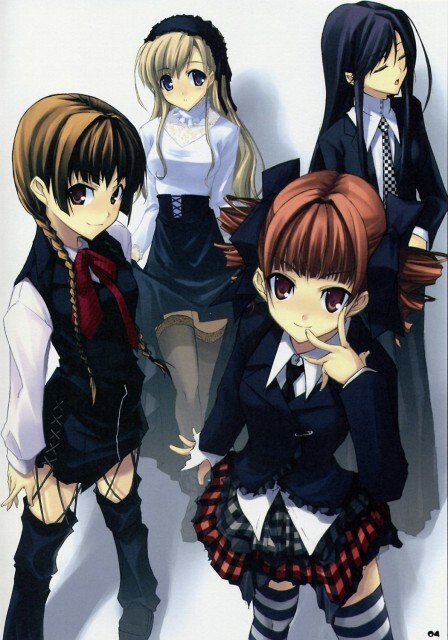 especially the fashion design ~ elegant, yet spunky..
urban fashion for lilian gakuen, huh? Waaaah. I've seen this before but I never knew that it was marimite. ^_^' Putting this in my favorites definitely! yea, its great that sachiko is wearing the suit jacket nd tie nd such. she looks so cute with the exasperated kind of expression & everything. it looks like it fans out into a weird skirt or wide pants or something though... other than that i -love- those clothes... . Awesome...just....awesome. This picture rocks so hard. Yoshino and Todou look really, really cool, Shimako is cute as always and Sachiko's expression is hilarious...*adds to favourites* I want those clothes!! That's great. I love this picture A LOT. i love the stockings on yumi chan! Lovely! I love the wearing of Yoshino! ^___^ +fav! thanks for it! Very cool scan! I love it! I would like to know is realy Shimako on picture? Good scan!Thank you for you sharing!